Astronauts Kate Rubins and Jeff Williams are all set to venture outside the International Space Station (ISS) tomorrow (Aug. 19) to install the first International Docking Adapter. This addition to the ISS will allow future private space vehicles to hook up to the station. First-time flier Kate Rubins and veteran spacewalker Jeff Williams will venture outside the International Space Station this morning (Aug. 19) to install a massive, crucial piece of machinery: a vital new docking port that will allow private space taxis to link up with the station on future missions. The spacewalk is slated to begin at 8:05 a.m. EDT (1205 GMT), NASA officials said during a news briefing. You can watch the spacewalk live here on Space.com, courtesy of NASA TV. The IDA being installed today is the first of two devices that will be attached to the space station as part of a new international standard that allows a variety of vehicles to dock with the orbiting lab independently rather than being grappled with the station's robotic arm. Williams, Expedition 48's commander, will head out first, and Rubins will hand off a bag of IDA installation tools before stepping outside the station. "This EVA [spacewalk] that we are going to be doing on Friday represents a very significant milestone on the path to establishing a commercial crew capability on board the ISS," Kenny Todd, the station's mission operations integration manager, said at the news briefing Monday (Aug. 15). "We're very excited to put this piece of hardware on the front of the station." Multiple previous spacewalks paved the way for today's installation. During four EVAs (extravehicular activity) performed earlier this year, and in 2015, astronauts routed cables for the docking adapter and installed a control panel, among other maintenance tasks. On Wednesday (Aug. 17), the ground robotics team successfully removed the IDA from the Dragon spacecraft's trunk using the space station's robotic arm, and positioned it 3 feet (0.9 meters) from the front of the port. This morning, prior to the start of the spacewalk, the ground crew used the arm to move the IDA closer to the port, so that it would be ready to be installed by Williams and Rubins. The International Docking Adapter as seen before its launch to the International Space Station. The new IDA, which measures 7.8 feet (2.4 m) in diameter, will allow for larger crews to launch from all different places around Earth and dock with the space station automatically. Boeing and SpaceX have contracts with NASA to send astronauts to the space station in 2017. If all goes according to plan, the spacewalkers will complete some additional tasks after hooking up the IDA. Williams and Rubins will install thermal covers, as well as set up mirrors that will allow future space taxis to autonomously navigate, align and connect with the space station properly. The team will also route some additional cables for the second docking adapter, which is expected to fly up to the space station next year. On Sept. 1, a second EVA will be conducted to perform more work on the IDA, during which astronauts will retract one of the station's thermal radiators. Williams and Rubins are part of a six-member space station crew. They arrived at the station on July 9, and are joined by Japanese astronaut Takuya Onishi and Russian cosmonauts Oleg Skripochka, Alexey Ovchinin and Anatoly Ivanishin. 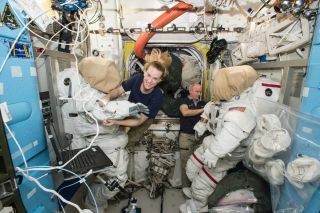 Visit Space.com later today for complete coverage of the spacewalk and a final wrap-up of the day's orbital activities.